There seems to be actual agreement that pot skirts make combustion stoves better. It is clear however that the bulk of deployed stoves do not have pot skirts. Therefore an inexpensive pot skirt that could be made in the third and fourth world for those deployed stoves would have some usefulness. 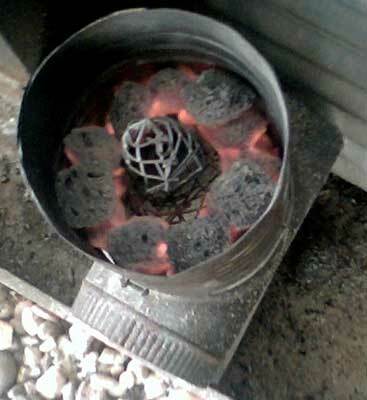 Images of experiments with a mesh wick in a charcoal stove. The original idea was to see if we could coax the gas from the fuel to climb up a mesh frame and burn above the fuel bed thus allowing us to see what was going on better and see subtle changes in CO burns.